Yes it’s that time again (if you can read it that is) where I have a look at the perennial geek designer from the amazing people at – TokyoFlash. The model is the BASIK Watch by José Manuel Otero and here it is. So let’s “at a glance” check the time . . . .
Basik – new time concept – if you can read it! Noooo, I’m not quite seeing what the actual time is here, but I’m sure I can work it out given time! Which for me is not quite the name of the game. I confess I like to wear on my wrist something beginning with W! Yes you guessed it – a Watch! and one that when I give it a quick glance immediately tells me the time and maybe even the day and the date! Now is that too much to ask? Well it seems to me that at TokyoFlash they are always attempting to challenge the old round dial concept clock face idea for showing the time, which like the original QWERTY keyboard worked for all sorts of very good reasons (and even that’s been challenged these days) and every time I see one of their new creations I start to get one of my awful migraines again! Now I don’t really mind them doing this as it’s great potty training and probably really mentally challenging for the young designer, but sometimes a reality check might be in order here. Because I and most of us I suspect want a gadget that simply, easily and clearly shows the time – no more – no less. It’s a bit like re-inventing the wheel I suppose. Why is it round? – I can even hear the new recruit to the Design Guild of Pointless Ideas, question. Would it not be better to make it square? And Oh of course we can round off the pointed bits to make it smoother yes and maybe – no maybe . . . an oval? But we’d maybe have to alter the suspension to compensate I suppose if it’s used as a vehicle . . .? And then there’s . . . .
Now – where was I – Oh yes – the Basik Watch . . . . Well it’s not really difficult when you study it for a while – something you can do with your time I suppose 😉 and this is the same image with the time disclosed at image top left. 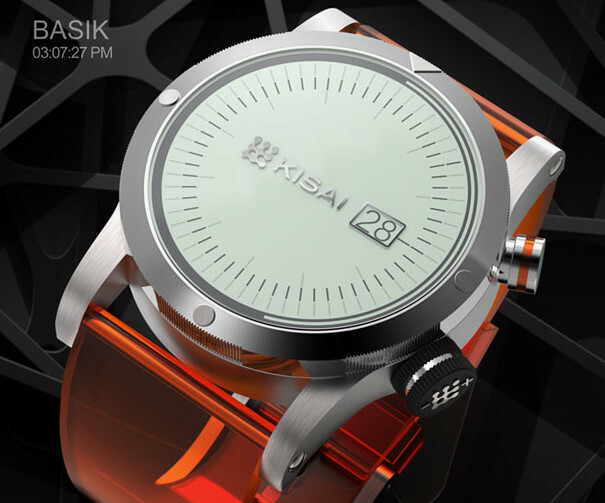 The Basik new concept time watch. Have you got it? Well the dial has 2 index rings – the Inner which is for the Hours and the Outer for the Minutes. These are in light grey unless activated as markers. You can see on the inner index a dark marker – at 3 (hours). Another dark marker is showing on the outer index indicating 7 (minutes) and the very outer continuous moving line thing which goes round the entire dial perimeter is showing at 27 – this is the seconds. Hence the time is 03.07 and 27 secs. And how do we know it’s 03 am and not 3 pm? well apparently it’s indicated by the changing colour of the dial – if it’s light colored then it’s PM and if it’s dark is AM – or perhaps the other way around – sorry but this migraine! Also you can move the outer bezel which in turn moves the entire dial around, so that if the watch is off your wrist and sitting on it’s side, you can move the 12 o’clock position to the top and the watch reads as if it was sitting upright – get it? Utterly fascinating and brilliant I am absolutely sure – but is it for me? Well sadly I am equally and absolutely sure it’s NOT . . . ! Anyway if you want to check it out HERE is where it’s at . . Now – I’ve taken so long with this Post that I’d better check the time myself! Seriously this is quite an unusual watch and one of the best of the alternative time readers out there in my opinion. The idea of using inner and outer indexes is not particularly new, though the dark indication markers are quite novel. Personally I would prefer the dark markers to be very much darker so that I could more easily see the time in less than ideal light. I like the large Date window which is easy to read and the Seconds animation perimeter is both novel and a very good indicator, firstly showing the watch is running and secondly a rather good seconds countdown timer too. As I said in the Post, which I admit to being a little tongue in cheek, it still is not really the watch for me. But I can see certainly see the attraction for many (possibly younger than I) who like something that little bit different. In fact I’m sure it wouldn’t take long to get used to to it and that “quick glance” might well be all you need. Anyway, hats off to José Manuel Otero for a pretty smart and different take on the more usual watch idea and congratulations – for it seems to work!